My record has a Matrix of YEEX 7 - B12 on the A side and YEEX 8 - B12 on the B side. I have a copy where the etching and labels are exactly like this release (https://www.discogs.com/The-Beatles-Something-New/release/10421080) except my copy does have "a subsidiary..." Thoughts? I would be so happy if people finally learn to list such releases under 'Miscelanneous'. These listings are more and more disaranged. Recently purchased this copy. However, matrix #'s on the rim are "machine stamped" and read as follows: SIDE ONE: "ST1 - 2108 - B2" SIDE TWO: "ST2 - 2108 - B2"....Both sides also have the "I AM" in a triangle and are "machine stamped" as well. Back of cover has "3" next to the RIAA symbol at the lower left, indicating a "Scranton Up to 1969 Modern Album of Long Island, NY" plant production. A fine album, but I find myself wishing that this American release did not exist, and that the USA would have been treated to fourteen excellent tunes from the UK release of 'A Hard Day's Night'. 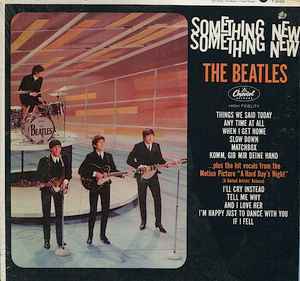 "Something New" may be the best of the 'hybrid' lps Capitol gave american Beatle fans. I had played the United Artists copy of "A Hard Day's Night" to death, but I was annoyed at having to pick up the needle when the George Martin film music started. "Something New" not only gives the listener all the songs from the movie, but adds songs which have been clipped from the english releases. McCartney's beautifully haunting "Things We Said Today", Lennon's classic take on Larry William's "Slow Down", two spirited pop songs ("When I Get Home", "Any Time at All") and Ringo's interpretation of Perkins' "Matchbox". "Komm, Gib Mir Deine Hand" is an anti-climax after a thousand listenings to "I Want to Hold Your Hand". It's a novelty and nothing more. There's a feeling of being ripped-off yet again. United Artists gave Beatle fans film music they didn't want. Capitol's niggardly attitude of issuing eleven song lps left us holes in the Beatle catalog. In retrospect, America would have been served better by having Capitol release the Parlophone issues with fourteen songs. But that's water under the London bridge.